Between 1780 and 1790 a major refurbishment of St George’s Chapel took place under the direction of Henry Emlyn, largely funded by George III. As part of these works, Emlyn, originally trained as a carpenter, designed a new organ screen and gallery dividing the Nave from the Quire. 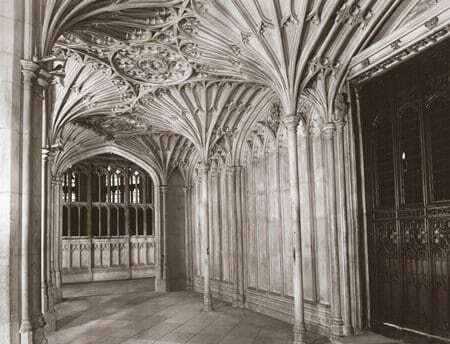 The fan vaulting under the gallery, which can be seen in this photograph, was intended to match the late fifteenth century vaulting in the Quire Aisles. Set up in 1790, it was decorated with bosses of St George and the dragon, roses and the monogram of George III within the Garter. The modern visitor will find it hard to identify the screen and gallery as an eighteenth century addition, since they blend so well with the remainder of Chapel. More curious still is the fact that they are not carved out of natural stone, but constructed from Coade stone, an artificial building material which was in vogue at the time. Eleanor Coade, who came to London from Dorset with her parents in the 1760s, tried her hand at sculpture before becoming acquainted with Daniel Pincot, the proprietor of an artificial stone factory in Whitechapel. At some point he must have expanded his business into South London, since the factory in Lambeth which Eleanor Coade came to run was originally leased in Pincot’s name. The South London business developed into ‘Coade’s Artificial Stone Manufactory’ and business flourished under Eleanor Coade, unmarried but assuming the title ‘Mrs’. However Pincot’s involvement ended abruptly in 1771 when she publicly dissociated him from the business for representing himself as the chief proprietor. Mrs Coade did not invent artificial stone, which was made principally out of china clay fired with a mixture of feldspar, marl and other minerals, but she seems to have developed the recipe and perfected the firing process to produce a superior product. She also had a flair for business and an ability to choose and retain skilled designers and workers, which ensured the excellence of her products. Because of its quality, realistic appearance and comparative cheapness, Coade stone became extremely popular with the many builders and speculators who were developing the metropolitan areas of London and of other major cities. Not only could it be moulded with relative ease, saving the need for intricate carving, but its remarkable resistance to weathering made it outlast original stone. George III and the Prince Regent were amongst Mrs Coade’s illustrious clients, employing Coade stone at Carlton House, the Brighton Pavilion and Buckingham Palace as well as St George’s Chapel, Windsor. The commission to replace the organ screen and loft at St George’s with a new one, six foot deep and scanning the width of the Nave, was a huge undertaking. Great care was taken to match the artificial stone to the original stonework of the Chapel and the precision of the moulding on the vaulting succeeds in giving the impression of intricate carving. Mrs Coade was also commissioned, in 1790, to model a frieze for the Edward IV monument and a decorative niche in the North Quire Aisle following Emlyn’s designs, whilst three statues of the Chapel’s patrons, St Edward the Confessor, St George and the Virgin Mary, were produced in Coade stone in 1799 for the niches on the West Front. As a Baptist, Eleanor Coade was not accustomed to producing religious imagery at her Lambeth factory and it appears that the figure of the Virgin Mary was taken from John Bacon’s design for a classical female figure, probably a Vestal Virgin, with a baby added by an inferior artist. A Coade stone font, which was presented to the Chapel by one of the Canons, Dr Majendie, was not specially commissioned but was purchased from stock. Although the Windsor Coade font no longer survives intact, similar fonts were ordered for Debden Church, Essex, and Milton Abbas, Dorset. In 1799 Mrs Coade and her business partner, John Sealy, opened a gallery in Westminster Bridge Road in which to exhibit samples of their work, and published an accompanying catalogue, ‘Description of Ornamental Stone in the Gallery of Coade and Sealy’. This included a list of the items supplied by Mrs Coade to St George’s Chapel, including the organ screen which was described as ‘much admired for its lightness and the richness of its groined ceiling’. After the death of John Sealy in 1813, Eleanor brought in her relative, William Croggon, to run the business. He continued to produce Coade stone until his own death in 1836, Eleanor having died in 1819. However, his son Thomas took little interest in the business and sold the site to Routledge and Greenwood, terra-cotta manufacturers, in 1837.